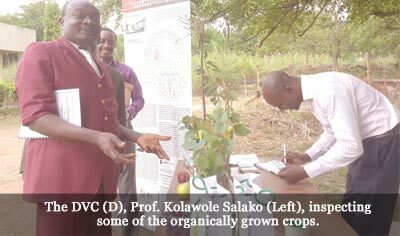 The Vice-Chancellor, Professor Olusola Oyewole, recently challenged researchers and participants at a conference to brainstorm on the strategies to entrench the use of organic agriculture in the nation’s agricultural production system and education curricula. 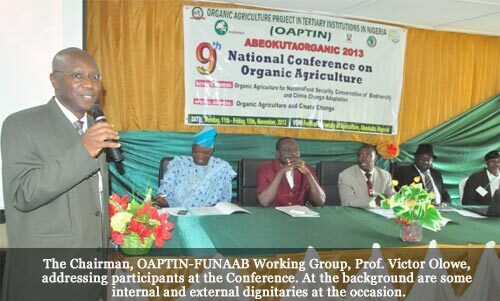 Represented by the Deputy Vice-Chancellor (Development), Professor Kolawole Salako, at the 9th National Conference on Organic Agriculture, the Vice-Chancellor said that it is no longer news that organic agriculture in the last decade, had become a money spinning enterprise, particularly, in North America and Europe, adding that these two continents currently accounted for about US$65 billion per annum of certified organic goods and products. Therefore, he opined that it was the time for Africa and Nigeria to key into the global organic trade. Professor Oyewole disclosed that after its recent Review of Academic Brief, FUNAAB had identified Bachelor of Science Degree in Organic Agriculture as one of the new academic programmes, being proposed for approval by the National Universities Commission and if approved, FUNAAB would become the first University in West Africa to run such a programme. The Vice-Chancellor added that FUNAAB would continue to carve a niche for itself as a pace-setter in agricultural development, having been designated by the World Bank as an African Centre of Excellence in Agriculture. He pointed out that the conference organizers, Organic Agriculture Project in Tertiary Institutions in Nigeria (OAPTIN), took-off from the University in 2004 and still has to date, its national secretariat, domiciled in the University. Reeling out some of the major achievements of OAPTIN, the Vice-Chancellor said the project had successfully trained 23 agriculture graduates under the Work, Earn and Learn Project (WELP), held eight successful national conferences, held the 1st and 2nd International Summer School programmes, and two International Workshops on Curriculum Development for undergraduate and postgraduate studies in West Africa, under the auspices of the European Union-sponsored West African Network on Organic Agriculture Research and Training (WANOART), based in the University. Worried by the increasing reported cases of food poisoning, environmental hazard, soil and water pollutions caused by synthetic chemicals, the Acting Vice-Chancellor, Ladoke Akintola University of Technology, Ogbomoso, Professor Adeniyi Gbadegesin, later called for the development of organic agriculture because it remained the only way out, if the world is to be immuned from the effects of such harmful chemicals associated with conventional agricultural practices. Delivering his keynote address at the occasion titled, Organic Agriculture for National Food Security, Conservation of Biodiversity and Climate Change Adaptation, Professor Gbadegesin, who was represented by the Head of Department, Crop and Environmental Protection of LAUTECH, Dr Iheme Olabiyi, said organic agriculture promotes soil enrichment, ecosystem, biodiversity and people’s health. The Vice-Chancellor said only LAUTECH could boast of certified organic agriculture farms, for the production of spice crops such as ginger, turmeric, lemon grass and cashew and noted that there is a lot to be benefited by Nigeria, if organic agriculture was well developed. According to him, organic agriculture would promote food security, job security, sustainable environment, and increased Gross Domestic Product (GDP) earnings of the country. The Don added that organic agriculture performed better than the conventional agriculture practice on a per-hectare scale, as he debunked the claim that organic agriculture cannot meet the world’s food demand. Similarly, the Vice-Chancellor of the National Open University, Professor Vincent Ado Tenebe, while delivering his speech at conference titled Organic Agriculture and Climate Change, observed that organic agriculture, if well developed could meet the country’s food demand, safe guard its natural resources and promote a healthy environment. Professor Tenebe, who was represented by his Special Research Assistant, Dr Epetu Ibikunle, pointed out those conventional agriculture practices, which involve the use of fertilizers, pesticides and bush burning methods often lead to harmful effects on man and the environment. He advocated for the adoption of organic agriculture in Nigeria, stressing that it would significantly reduce the depletion of limited natural resources. 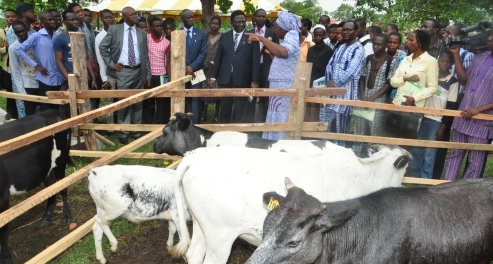 Dignitaries present at the occasion included the Executive Secretary, National Universities Commission, Professor Julius Okojie, who was represented by the Deputy Director, Entrepreneurship Development, Mrs. Lauretta Anchor; the ‘father’ of organic agriculture in Nigeria, Professor Jire Adeoye; and the project’s Zonal Co-ordinators from the six-geopolitical zones of the country.